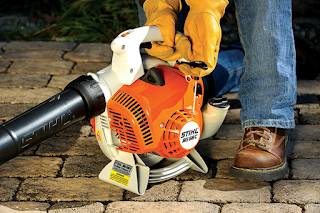 STIHL USA News: Are You Ready For Blower Season? Thinking about buying a STIHL blower? With over 15 models to choose from, STIHL has a blower to meet a variety of different needs. The challenge is finding which one is just right for you and your outdoor clean-up jobs. To get started ask yourself the following questions. The answers will help guide you to the right blower for you. How Big Is The Property You Need To Clean? Will You Be Using It For Long Periods At A Time? Are There Any Noise Restriction Issues To Consider? If you live in an urban setting, or have smaller areas that need to be cleaned like driveways, sidewalks and patios then models in our homeowner line are probably right for you. The gasoline-powered STIHL BG 50 is perfect for blowing light materials like grass clippings and leaves. At only 7.9 pounds it is one of the lightest gasoline models on the market, but has the air power to get clean up jobs done quickly and easily. For an upgrade select the BG 56 C-E, with its Easy2Start™ feature that makes starting virtually effortless. The simplified starting settings mean that the choke automatically switches back to the "run" position when you pull the throttle trigger. And even better, if you reserve this unit before 9/15/2015 using STIHL Express you will save $10. And if you are interested in the convenience of electric power, check out our corded electric and battery powered blowers. choice for you. 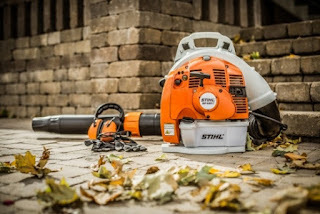 The fuel-efficient STIHL BR 350 delivers professional-grade performance for homeowners everywhere. Its rugged engine provides enough blowing power to tackle heavy debris, while delivering exceptional fuel economy. The anti-vibration technology enhances your comfort during long runs, which are made possible by a large 57.5 oz. fuel tank. 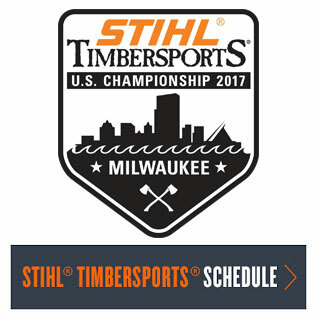 Pros rely on the power of STIHL for their businesses. With its powerful, fuel-efficient engine, the BR 600 MAGNUM® sets the standard for professional-grade blowers. It produces the highest air volume and velocity of all our backpack blowers, yet features a low-emission engine, making it a great choice in both urban and rural areas. And because we know that for pros time is money we are proud to introduce the new BR 450 C-EF the only professional blower on the market with an integrated instant electric start. Operators can start the unit with a push of button while still wearing it. No more wasting gas idling between jobs or having to remove the unit to pull start. And its telescopic tube adjusts to accommodate a variety of operator heights. In noise sensitive areas, or just for your own personal preference, we offer several low-noise models to choose from. For homeowners, the battery powered BGA 85 is great for use in noise-sensitive areas and it still packs serious air power with air speeds over 100 mph. In the gas powered blower line the BG 66 L and the BR 500 are both designed to deliver professional blowing power while reducing noise. 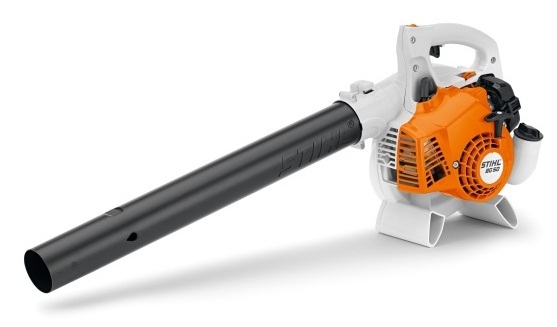 Whether it’s a house, farm, or ranch, there’s a perfect STIHL blower to get the job done. To help make your decision, check out the STIHL Product Selector, an interactive guide that will narrow your search and help ensure you’re packing the right kind of air power for your property. Stop by your local authorized STIHL dealer, with over 8,500 locations, there’s an expert nearby who can help you find the right blower to meet your needs.